This new self-cure material will allow dental labs to cope with high production while keeping energy costs and labour to a minimum by avoiding the additional equipment, increased labor, energy use and cure times associated with heat cured materials. 1000g Powder and 500ml and 1000ml Liquid. A trial pack 100g/50ml is also available. Controlled aesthetics and by up to eight percent increased translucency without any loss of strength: The new Nacera Blue X Translucent Liquid by Doceram Medical Ceramics now answers the request of many dental technicians for a highly translucent zirconium oxide with similar aesthetic properties to lithium disilicate: The novel liquid which has been specially developed for Nacera Pearl Shaded 16+2 and Pearl Multi-Shade is not just breathtakingly aesthetic, but it also shows a natural colour result. Due to its targeted applicability, its handling is particularly flexible and efficient. In addition, the mechanical strength of the material has been maintained. 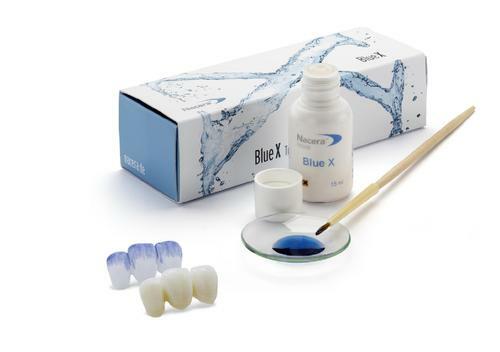 In short, Nacera Blue X allows you to individually increase and control the translucency of zirconium oxide without reducing its stability! 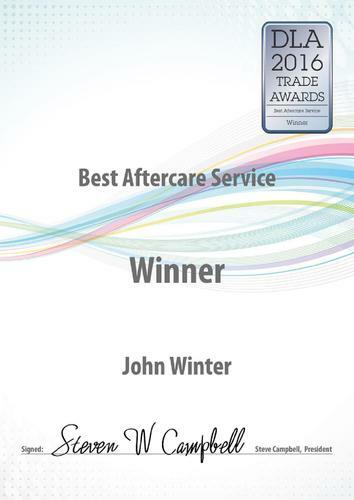 John Winter won the Best Aftercare Service Award at the Dental Laboratory Association's Trade Awards. The awards, in their third year, are hosted to recognise those that are providing service abd roducts above and beyond the norm. Spoorted by the Dentistry Show and the DTS 2017, there were eight categories at the DLA Trade Awards, Where John Winter were also shortlisted for the Trade Company of the year. Straumann will present a myriad of ground-breaking innovations at The Dental Technology Showcase 2017. As dentistry embraces the digital age like never before, this year’s Dental Technology Show will provide a host of opportunities as Straumann unveil a number of exciting developments to their CARES® Digital Solutions portfolio, including leading scanning and milling technology, 3D printing and centralised milling. Yenadent introduced new D6 milling machine to the market . The new Zirkonzahn Library Download Center is now available for free for all exocad® and 3shape users. With the sinter metal blanks developed by Zirkonzahn, you can easily manufacture non-precious restorations (single crowns, large-span bridges up to 14 elements, metal frameworks, telescopes, bars, dowels, attachments) in your own lab. The high-quality cobalt-chromium alloy can be sintered with two different furnaces: with the Zirkonofen 700 Ultra-Vakuum sintering furnace for both zirconia and sinter metal, by using the sintering adapter, or with the new Sinterofen 300S for sinter metal only, whose combustion chamber can host approximately 50 sinter metal elements, and that can sinter 2 full-arch bridges or 6 bars in one process. With both of these furnaces the material is sintered under high vacuum, without shielding gas. The raw material has a shrinkage factor of just 7%, which makes its torsional stability during the sintering process very high. Like this, all milled dental restorations can be sintered with total lack of stresses. Zirkonzahn Sintermetall blanks are available in 7 different heights. 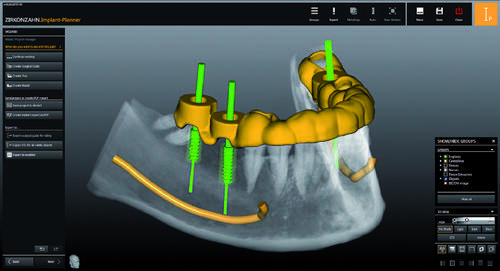 Our constant research aiming at offering you the best solutions for your digital workflow led us to a further achievement: the new Zirkonzahn.Implant-Planner software. Our new software has been conceived with the objective of simplifying the way you plan your cases and, at the same time, improving the cooperation with the whole dental team, which results in better interactions with the patient. techniques to be integrated in the workflow for the realisation of dental restorations. 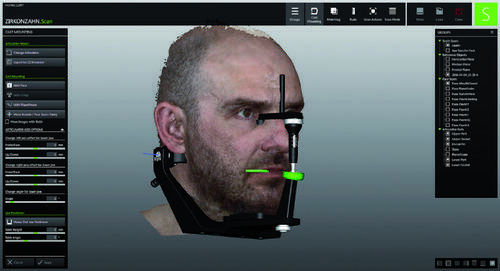 Zirkonzahn’s Face Hunter facial scanner offers a tool that enables 3D scanning of the patient’s face. In the beginning of the CAD/CAM technology people were used to rather ill-fitting offset copings and a lot of money was needed, as well as specific locations, due to the machines size. Today, requirements have increased significantly with regard to milling results as well as to the practical logistic handling. Laboratories of various dimensions and manpower want to take advantage of the modern CAD/CAM technology. After the initial CAD/CAM euphoria, and the even partially euphoric disorientation, the requirements for the acquisition of a CAD/CAM system are much clearer and more differentiated. “I will discuss how dental technicians can go back to basics to add individuality and their own ‘fingerprint’ to each and every case that they do (applicable for both fixed and removable prosthetics). I hope this will help to give them a competitive edge in what is now a vastly outsourced and technology-driven industry. “In addition, I will highlight the importance of removable prosthetics in every aspect of dentistry and offer my own top tips to help delegates improve their workflow. Finally, I hope to explore the importance of teamwork and communication between laboratory and practice as a means of ensuring the highest quality of prosthesis for every patient.” The DTS Lecture Theatre 2017 has been programmed by the Dental Technicians Guild (DTG) and Bill will join an impressive speaker line-up including Phil Reddington, Carl Fenwick, Chris Wibberley, Eugene Royzengurt, Ian Smith, Von Grow and Jason Smithson. Additional features such as the Digital & Innovation Theatre, ADI Implant Theatre and Dental Business Theatre – delivered by Practice Plan – will offer even more insight and inspiration for delegates, with hours of vCPD available throughout. What’s more, the trade floor will host more than 100 lab-dedicated exhibitors, providing on-stand learning, demonstrations and fantastic deals for all. So whether you are looking to go back to basics and refine your skills, or to purchase new technology that will help you to raise standards. 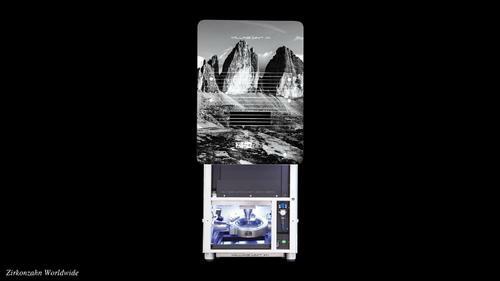 REITEL introduces new devices for dental laboratory and dentist surgery during DTS at booth C08. New polishing lathe and steam clean work place are introduced to UK dental laboratories. A preheating device for dentist surgeries is launched: composites, Natriumhypochloride and wax bites are well tempered for patients well-beeing. Handler has been manufacturing denture processing equipment in the USA for decades and now presents the latest technology innovation. 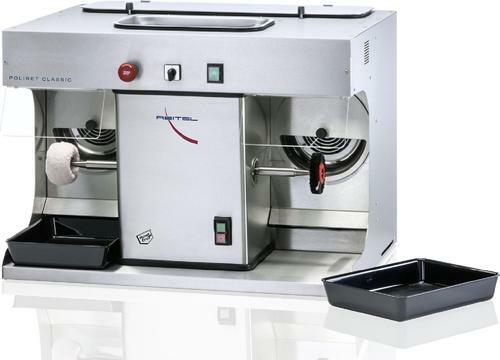 The new 2010DCU-E 8 flask denture curing unit is unique, sophisticated, compact, easy to operate and best of all affordable for any size lab. The 2010DCU-E with europeann cord set plugs into any electrical outlet. The digital controls allow the user to program two different temperature settings and time settings. For example, you can preprogram the 2010DCU-E to cure for a period of time and then automatically go to higher temperature for boil out. Once you set your program all you need to do is press start. The 2010DCU-E is easy to drain with built in drain valve. All stainless steel tank with removable flask tray and powder coated finish gives the unit a contemporary look and long lasting performance. Go to www.handlermfg.com or contact Handler directly at rickladuca@handlermfg.com or 800-274-2635 for more information.